Now compatible with both PC and Macintosh systems! ASA Prepware, the FAA Knowledge Exam software that has been completely rewritten to take advantage of advances in technology as well as incorporate feedback from customers over the years. As with all previous versions, users can take true-to-form practice exams and get immediate feedback on whatever test areas need more work. Tailor-made practice sessions improve performance in the areas you need to concentrate on the most to pass your test with flying colors! Questions are supported by study guides and comprehensive explanations for correct and incorrect answers. Instructors can create pop quizzes of any length, on any subject matter, to supplement the study sessions. Each Prepware title includes all aircraft categories (airplane, rotorcraft, glider, lighter-than-air, powered parachute, weight-shift control). You tell the software which test you're preparing for, and the study sessions and practice tests are generated accordingly. Now compatible with both PC and Macintosh systems. CX-3 electronic flight computer is built into the program, accessed by a click of a button during study sessions or simulated tests. Make and save user notes while studying in a Notes field, for annotations and comments as you work. "Google"-like search capabilities…search for a word or phrase in the entire database of questions, answers, and explanations. Build a follow-up quiz from your airman test report. The FAA doesn't tell you which questions were wrong on your test—they only give you the subject matter knowledge codes. You can plug the codes into the program to create a custom post-test follow-up, which is required prior to taking your checkride. Simulates the CATS testing center in screen layout, buttons, program navigation; replicates what you'll see when you take your official FAA exam. You can choose to print results, or e-mail them to your ground or flight instructor to obtain endorsement to take the FAA test. Built-in study guides are there at a click of a button for study sessions, with the same comprehensive text and figures found in ASA's popular Test Preps and Fast-Track Test Guides. Performance history reflects individual tests, not just cumulative performance. View a performance graph depicting total score and a score for each subject, as well as review the test (shows your selected answer, the correct answer and explanation). All figures are available onscreen. The printed FAA Computer Testing Supplement (CT-8080) is sold separate. Download and automatically update the database each time the FAA releases new or changed questions; also, the free email subscription service keeps you informed anytime a change is made. Realistic test simulation, study and review models, detailed performance graphs, comprehensive study guides and built-in timers give you the confidence you need to ace your FAA exam. Whether you choose to simulate an actual FAA test, or study specific subjects and questions, Prepware has the tools you need. ASA's Prepware combines all the information applicants will find in the Test Prep Series. 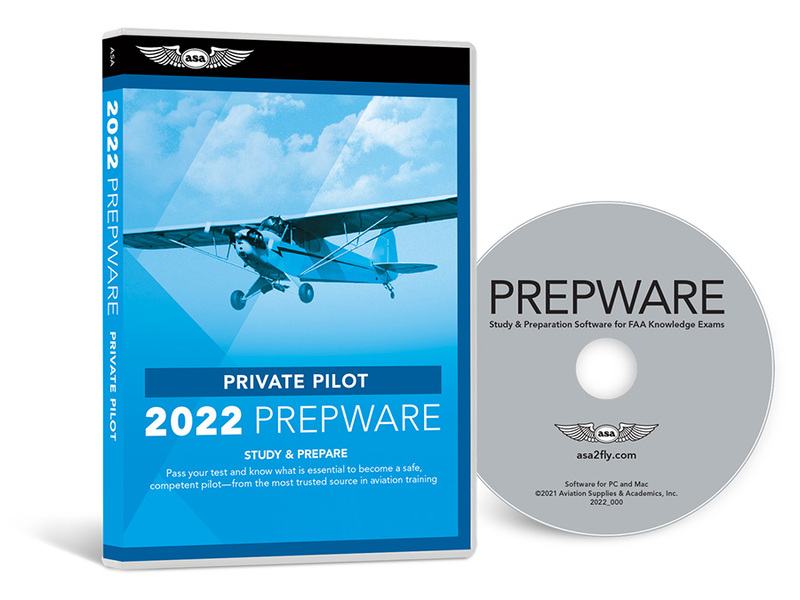 Prepware gives you everything you need to be confident and prepared for your FAA Knowledge Exams. Windows compatible processor, 800 MHz or faster (Windows XP), 1.0 GHz or faster (Vista and Windows 7). 345 MB available hard drive space. 256 MB System RAM (Windows XP), 512 MB RAM (Vista), 1024 MB (Windows 7), 2048 MB (Windows 8/8.1), 4096 MB (Windows 10). Microsoft .Net Framework v4.0. If your system does not have this version of .Net Framework already installed, the Prepware installer will install the correct version before installing the program. Macintosh computer with Intel processor. 324 MB available hard drive space. OS X Snow Leopard (10.6), 1024 MB RAM. OS X Lion (10.7), OS X Mountain Lion (10.8), OS X Mavericks (10.9) 2048 MB RAM, OS X Yosemite (10.10) and El Capitan (10.11) 4096 MB RAM. Pros: Shows references to answers for better understanding, saving time. Review: Excellent training. Take it with you, on computer or at home training. Pros: Updated information, just like the real test, you can create your own study sessions. Review: The practice tests are just like the real thing! When I took my test It felt like I was at home on ASA. Don't hesitate to buy this if you are getting ready for your written. Review: What can I say? If you're pursuing a pilot's license, you need this. After you've run through the book, you can measure what you've learned with the testing software. Pros: Easy way to memorize while driving. Readers were great and alternated. Review: Coverage, delivery and pacing we're all excellent. Strongest area for me was on the federal regs and definitions. Completely painless. Never tired of the readers. Could listen multiple times and get something new each time. Highly recommended! Cons: Although material with figures can't be covered as well, they do point out possible mistakes that can then be kept in mind. Q: Can I install this on my home computer and my computer at work? A: The license allows you to install the software on up to two (2) computers used by you. Q: How does the CD Rom differ from the Downloaded Prepware version? I see reviews that indicate some people have had to purchase additional supplements or work books, but not sure if they are referring to one version over the other. A: The only difference is that one is a download and the other (this one) is a disk. Other than that, it's exactly the same. There are no paper manuals with either. Q: Would I be able to send my test results to ASA so they could endorse me for the FAA written test? A: You can choose to print results, or e-mail them to your ground or flight instructor to obtain endorsement to take the FAA test. Or, you can get the instructor endorsement (sign-off) directly from ASA completion of the course. 1. You can print individual figures from within the software. Select Tools | Figure Library and then select/search for the figure you wish to print. 2. You can print the entire Testing Supplement with all of the figures by downloading the Computer Testing Supplement PDF. 3. You can purchase a printed copy of the Computer Testing Supplement for only $6.00. Q: is it possible to set up a practice test/quiz that just includes questions for the private pilot airplane FAA Exam? i've heard that when you set up practice questions for Private Pilot, there are other categories like Hot Air Balloon that are included. is that true? is there anyway to filter that out? i am only interested in the Private Pilot Airplane Questions. A: Yes, absolutely. You can setup a test for airplane, rotorcraft, glider, lighter-than-air, powered parachute, or weight-shift control. When you choose the test, it will ONLY give you questions that are either general (apply to all tests) or for that specific aircraft category. You can set it up to focus on specific knowledge areas such as Weather, Airspace, Systems, etc. Q: what does ASA stand for? A: ASA is name of the company that produces this software. It stands for Aviation Supplies & Academics, Inc.
Q: can i use it with Mac? Q: Does this software have all the study materials included, or will I need to buy aditional books and software to support it. A: This software includes all of the questions on the FAA knowledge exam as well as on-screen figures for reference to specific questions. If you want the official testing supplement, it is sold separate here. Q: Does this item cover rotor craft as well privot? A: Yes, it covers both fixed wing and rotorcraft. Test prep book and software for airplane, helicopter, gyroplane, glider, free balloon and airship.